Ben Roethlisberger led the Pittsburgh Steelers to a narrow win and the Dallas Cowboys overcame the Atlanta Falcons on a day of NFL thrillers. Fans who enjoy last-minute finishes had to be thrilled on Sunday, as almost every game was decided inside the two-minute warning, several as time expired. 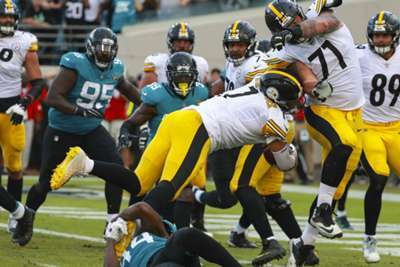 Roethlisberger's one-yard touchdown run with five seconds remaining capped a 20-point rally as the Steelers beat the Jaguars in Jacksonville 20-16. In Atlanta, Matt Ryan hit Julio Jones with a 34-yard TD strike to tie the game with one minute, 52 seconds remaining. But the Cowboys drove 51 yards in 10 plays to set up Brett Maher with the game-winning, 42-yard field goal as time expired in a 22-19 win. Redskins kicker Dustin Hopkins had his shot at a last-second game winner, but he missed from 63 yards as the Texans held on 23-21. The Panthers scored a touchdown with just over a minute remaining against the Lions, but rather than attempt the PAT to tie the game, opted to go for a two-point conversion. The attempt failed and Detroit won 20-19. The craziness continued in the later games. Denver upset the Chargers 23-22 on a 34-yard field goal by Brandon McManus as time ran out. And Oakland's Daniel Carlson kicked a 35-yard game winner as the clock hit zero to help the Raiders beat the Cardinals 23-21. Redskins quarterback Alex Smith suffered a broken tibia and fibula against the Texans and will undergo surgery, according to coach Jay Gruden. Titans quarterback Marcus Mariota left Sunday's game against the Colts just before half-time with an elbow injury and did not return. He was replaced by Blaine Gabbert. Both Texans guards, RG Zach Fulton and LG Senio Kelemete, went out with injuries in the first half. Saquon Barkley made history as he became the first Giants rookie with a rushing and receiving score in the same game in nearly four decades. Andrew Luck reached 160 passing touchdowns on Sunday against the Titans, tying Aaron Rodgers for the second-most passing scores through a player's first 80 career games. Roethlisberger's game-winning drive against the Jaguars was the 41st of his career in the fourth quarter or overtime, putting him ahead of John Elway for sixth-most by any QB since the NFL-AFL merger. Panthers coach Ron Rivera, on his decision to go for a two-point conversion late in the loss to the Lions instead of kicking a PAT to tie the game. "I was going for the win. That's just the bottom line." Roethlisberger, after calling his own number and barely scoring on a one-yard touchdown to beat the Jaguars late: "I don't know what option I am, but it's way down the list. You just find a way." Buccaneers wide receiver DeSean Jackson, after a loss to the Giants, said his team need more heart: "I feel like a lot of guys on this team fight, put their best foot forward. But we've just gotta have more guys out there, I guess, with heart. We can't keep being the team on the other side of the ball that's always losing."